Seven Card Stud is a classic poker game which can take a lifetime to master. Versions of stud poker that use three cards date back as far as the 1770s. Five-card studs became more common during the 1860s, when they proved popular among Union and Confederate soldiers. 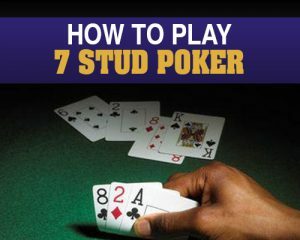 Over the last few decades, seven-card studs have become standard, both in and out of casinos. The function of a game can largely depend on how many rounds are included. For instance, games like Mississippi and five-card-stud—which have four or less betting rounds—work well with pot or no-limit play, while games with more rounds work better with fixed or spread limits. In all practicality, betting rounds should be set to higher limits as the game advances. Example: if a game is called $5/$10/$20 seven-card stud, it will allow bets of $5 in the first couple rounds, $10 in later rounds, and $20 in the final round. Stud betting rounds are generally named after the number of cards that each player is dealt at the start of a given round. Therefore, if the game starts with all of the players having three cards, the game is called “third street.” Likewise, if the players each have five cards in the first round, the game is usually called “fifth street.” The final round is usually dubbed the “river” or “end” round, no matter how many cards are dealt. Five-card stud and seven-card stud poker are both offered at Commerce Casino. Before a game of Seven Card Stud begins, all players ante a nominal amount (the exact amount depends on the game, and is displayed in the table’s title bar). This is the cost of being dealt into the hand. For example, the ante is $0.15 in a $1/$2 game. Each player is initially dealt three cards, two hidden hole cards and one face up. The player with the lowest exposed card is the ‘bring-in’, and is forced to start the action. They must make either another nominal bet (the exact size of the bring-in depends on the game) or, if they choose, a full bet of the lower betting increment. Action continues clockwise around the table until betting is complete for the round. Each player now receives another exposed card, called ‘Fourth Street’. The first player to act is the individual whose exposed cards have the highest poker value. For example, a player with an exposed pair of Kings would act first, if no other player is showing a pair of Aces or better. This player may either check or bet the lower structured betting amount (for example, $2 in a $2/$4 game). Please see the ‘Additional Stud Rules and Situations’ section below for an exception to this rule. Each player now receives another exposed card, called ‘Fifth Street’. Again the first player to act is the individual whose exposed cards have the highest poker value. There is a round of betting. Starting on Fifth Street and for the rest of the hand, all bets are in big bet increments ($4 in a $2/$4 game). Each player now receives another exposed card, called ‘Sixth Street’. Again, the first player to act is the individual whose exposed cards have the highest poker value. There is a round of betting. After the pot is awarded, a new online game of Seven Card Stud poker is ready to be played. In Stud, as with other forms of poker, the available actions are ‘fold’, ‘check’, ‘bet’, ‘call’ or ‘raise’. Exactly which options are available depends on the action taken by the previous players. Each poker player always has the option to fold, to discard their cards and give up any interest in the pot. If nobody has yet made a bet, then a player may either check (decline to bet, but keep their cards) or bet. If a player has bet, then subsequent players can fold, call or raise. To call is to match the amount the previous player has bet. To raise is to not only match the previous bet, but to also increase it. Bets and raises in Limit games are in pre-determined amounts.